Absolutely loved the article in the last GCA and appreciate the writers research efforts as well as the perspective from Mr. Norton's insights and personality/writing style. I could see why people would think regular rifles were used. Once the Marines rebarreled a NM rifle with a standard barrel, and the NM polished bolt was blued by the Marines. Literally the only way someone could easily tell a rifle was a former NM, was by seeing the receiver rails and follower were polished. There are some small tells, but none that an average person would ever see or take note of. The only other way is if it still retained it's numbered C stock, but that is very rare on existing examples. That is also backed up in the team documents, where they state that they restocked these rifles a lot. If someone is making a claim that they did make standard rifles into Unertl Sniper rifles, I think the burden of proof is on them finding actual real documentation that state the Marines did so. Because all the sniper docs I have from WWII, the Marines state that before, during, and after only former Team or NM rifles were used. Now on the Winchester A5/Lyman A5 rifles, they state that they did build those with standard rifles, and that might be where some confusion has come in as well. But that was a different sniper rifle program, but did run at the same time as the Unertl program. Even the Marines addressed this in WWII, stating that a lot of confusion had happened between the Unertl and A5 programs. These are the polished rails and follower of a Marine Special Target rifle. This would be the only easily visible way to tell the rifle was a former NM after the Marines had converted it to a Special Target. To the average user, they would never notice this trait. 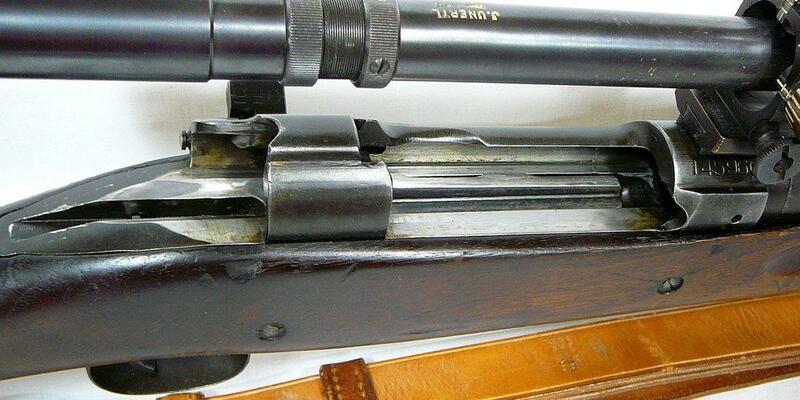 Otherwise it would have looked like just a standard M1903 to most people. I am truly honored Bob that you gave me a chance to publish it. I also hope you aren't catching too much flak because of it. If someone gives you a hard time on it, feel free to tell them to contact me. I am always willing to listen to new evidence. But quoting hearsay, or quoting someone else's research when you have no clue where they got the notion, is something I frown upon. When you start to trace back the common misconceptions of these rifles, you realize a lot are based more on someone's opinions, that have been stated as a fact. But again Bob, it is always a honor to work with your sir. I truly cherish every article I have a chance to work with you on, and hope to have many more. It was a great article Steve, no matter what publication, I enjoy articles that debunk or make people rethink the internet myths or uncorroborated hearsay. Read that article too. Well researched and well-written! I'm still in the process of writing an article for submission to the Journal on a 'Gun Shop rescue' M1 . It looks to be an all-correct/original 1942 Garand. Even had an original WW1 1907 Type-1 sling attached (made by the B.T.&B.Co.). GCA Journal articles written to such high standards provide a good model to emulate. an original WW1 1907 Type-1 sling attached (made by the B.T.&B.Co.). is that a gas trap?